MESO is a realtime, ultra-high definition video installation. It randomly cycles through thousands of images of digital landscape data covering the majority of North America. Each image is a direct translation of digital elevation data into map form, where white represents the highest surface elevation in the area, and black the lowest. No other information is included or implied. In removing all of the usual context from these images of the Earth’s landscape, we reveal patterns and forms inherent in the land, but normally hidden from view. The title “MESO” stands for “meso-scale”, or “in between scales.” The data in this work are in between two scales that viewers find familiar: the global scale, such as the shapes of continents and nations; and the local, micro-scale, such as a person’s town or neighborhood. The time scales involved their formation, as well, are short compared to global tectonics, but long compared to landslides and construction. The middle scales had been too far removed and too many in number to be part of a common language of landscape. But the recent technological emergence of powerful sensors, supercomputers, large-scale data storage, and global networking finally allows exploration of these meso-scales, not just in geomorphology, but in all areas of science. This work aims to methodically reveal the myriad shapes and patterns of the Earth’s surface at these intermediate scales. 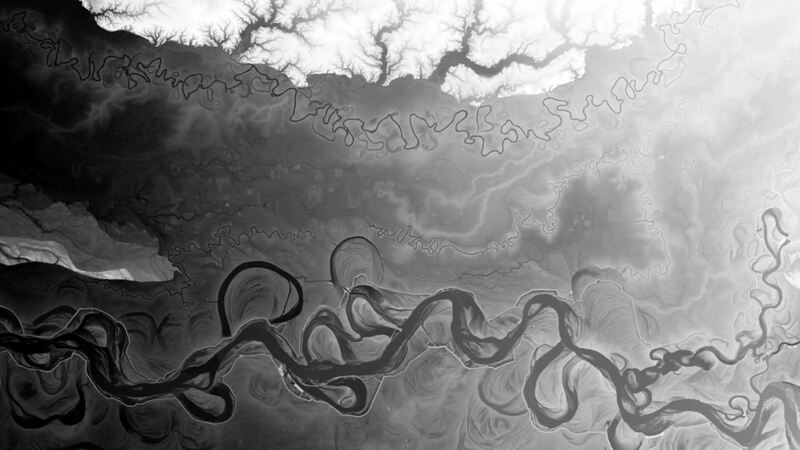 This work uses 1-arcsecond digital elevation data from the US Geologic Survey, processed by the open-source packages GDAL and NetPBM and the artist’s own scripts.